The Lavender Twist Weeping Redbud tree is an awesome specimen that everybody should have in their yard. The photos you see here are The Lavender Twist that I had in my front yard of the house we just sold. Redbud trees have an interesting way of displaying their blooms. The flowers appear in early spring before the tree starts to make leaves. The flowers are tiny and delicate, it’s almost as if they are glued to the branches. 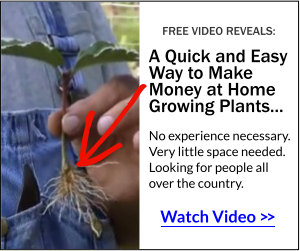 Special: Get Paid to Grow Plants from Home—Mine Have Earned Thousands! Lavender Twist Weeping Redbud trees bloom really early in the spring and unlike Weeping Cherry trees, the flowers are pretty doggone tough. I’ve seen them go through frost after frost without fazing the blooms at all. That’s a huge advantage for a tree that blooms early in the spring. The top photo was taken in early spring when the tree was in full bloom. The middle photo was taken in the middle of summer when the tree is covered with those round, a little bit heart shaped leaves. The bottom photo was taken at the end of January when the tree was completely snow covered. Snow covered Lavender Twist Weeping Redbud tree. Lavender Twist Redbud and other weeping trees covered in snow. The second tree from the right in the above photo is the Lavender Twist. Also in this photo are three different kinds of weeping Japanese maples and the big tree in the background is a Golden Curl Weeping Willow tree. Where to buy a Lavender Twist Weeping Redbud tree? The Lavender Twist grows nicely in hardiness zones 5 through 9. Can you grow one in zone 4? Probably, but you are pushing the zone limit a bit. If I lived in zone 4 I’d have one in my yard. I would take that chance. The ideal place to buy a Lavender Twist would be from a retailer in your local area. Call around, especially in the early spring, to see if your local garden centers have them or will have any coming in. You can check at the big box stores, but this is not something that they typically carry. But you never know for sure. If you call them on the phone they probably won’t know, you really need to go look. A local landscape contractor might be able to locate one for you from a wholesale grower but chances are they will only work with you if you hire them to plant the tree. But that’s not a bad thing. Writing a check is a lot easier than lugging a tree home, digging a hole, carrying the tree across the yard, then trying to get it in the hole at the right depth, getting straight and staking it. If you want to order one online you can do that. The tree you get will likely be smaller, but hopefully the price will affect that. If you buy a smaller Lavender Twist you will need to stake it and train it into a nice shape. You have stake it and get it to grow upright first, then once you get it to a height of 6′ or so, start shaping the head to look like the one in these photos. Lower branches should be removed. Don’t be afraid to trim your plants! The more you trim them the happier they are! Questions or comments? Post them below and I’ll come back and visit your questions. I am in zone 5. I want to plant a Lavener Twist in a sunny spot but it will be exposed to NorthWest winds. Would they be happy here? Lavender Twist are pretty darn tuff, I think it will be fine. Not much you can do but give it a chance. This is how you test to see if a plant, or a branch on a plant has died. Just scratch the bark of your plants with your finger nail. If the tissue below the bark is green and firm your plants are fine. If the tissue is brown and mushy that part of the plant is dead. Could it have been planted too deep? I put my lavender twist weeping redbud in about four years ago. It has been doing great, but I think something is wrong. It has not bloomed yet?!? I am zone 5, Chicago, Illinois. Do you know if it could still bloom or is there anything I can do? I can’t imagine it not blooming. They are late this year, mine are just starting to show flowers. Hi, Our neighbor gave us a twisted lavender redbud about 7 years ago. It’s remaining very short and we prune it back every fall. 1. I’d like to relocate it next fall as it really is not in a good spot. Do they like to be moved? 2. About 10 ft away from this one, I have 2 plants that look just like the twisted lavender coming up since last year. Is it possible that they are volunteers of the original plant? I know they are red bud variety as they had the purple flowers and now the heart shaped leaves. Janice, You can move it as long as it is dormant, it should be fine. The two volunteers are probably seedlings. They might be weeping or could be more of an upright redbud. I live in zone 7! But on a mountain, 3100ft., in western NC, which has lots of wind. Can a twisted take lots of wind? Lots of hardy plants, like Azealeas, do not make it up here. Thanks, for any help! I’d say yes, but I don’t know for sure. can it be grown from seeds ? No it cannot, won’t come true from a seed. And it’s patented, can’t be propagate while under patent. Mike, I love your site and the information you give is very helpful. I just received my trees from Sprinhill, I bought 2 because I just fell in love with them. I didn’t know I needed to train them though…. Thank you for the information. I bought a twisted red bud last year (2016) and although it is starting to bloom (spring 2017 in Savannah, GA) I do not see that it is making new limbs. There are two spindly ones now. What should I expect? It is in my front yard and gets 6+ hours of hot sun a day. That’s normal. It will bloom before it starts growing. Be prepared to trim and train your tree as it grows. I saw a weeping Redbud tree in Euless Texas. I do not know where to buy one..do you recommend any online company? There is one in our neighborhood and it is so unique. I don’t, but check out any online seller first at Garden Watch Dog to make sure they are reputable. Springhill Nurseries sells them. That’s where I bought mine. Hey Mike, actually I bought my lavender twist from you last year or the year before. I have a lot of hostas and just had 2 pick-up truck loads more given to me, I thought they’d look good under several of my trees. The lavender twist weeping redbud, my river birch, a red maple, a purple plum and a couple dogwoods. Someone told me there’s a nursery on narrows road that has climbing roses. I’m trying to blend some robin hood hedge roses into an old hedge a little ways before our wood line, do you have any regards above. The nursery on narrows road is Springlake Nursery. Tell Brenda I say hi! Help! A big storm took out quite a bit of my twist weeping redbud. I planted the tree last August and it was over 6ft. The heightest branch came off and left a jagged nub at the top (the tree is now about 4ft.) and a layer of the bark was torn off (18in. Or more missing from the top down). Do I need to protect the freshly exposed bark? Do I need to do something with the big nub at the top, which is also torn and exposing fresh bark? I have pictures to send, but I can’t attach them to the comments box. I can email them if needed. You are the only expert I trust! Thank you in advance. Jenaea, I don’t do pictures, I don’t see incoming email. I can’t find my post! I had a question about whether to snip off the limbs of my twisted lav weeping redbud that arrived from online as just a 3′ stick. Some of the limbs are double and I asked if I should snip off one. And when? Did you see my first post, please? Thank you! Hi Mike – My weeping lavendar twist redbud is brand new. I got it online and it was just a 3′ tall stick when it arrived. It now is pushing out limbs and leaves and this is where my question comes in. Where there are two limbs coming out at the same time, do I pinch one off? Now? Or wait until fall? The limbs are about 6 – 8 inches now. It is staked. It is not growing height-wise, but is branching nicely. Thank you for any advice! Thank you. I watched that vid before I sent my question. My weeping redbud doesn’t look anything like yours. It’s just a stick with a few short branches with leaves. My question was, do I pinch off one of the small, new branches where there are two growing? Thank you, again. Yes, you need to establish one single stem that you can train upright. I live in London Ontario, and the weather is going down to 9 degrees celcius on sunday. I have a weeping lavender tree. They are pretty hardy but covering when going below freezing is always a good idea if the tree is in leaf. 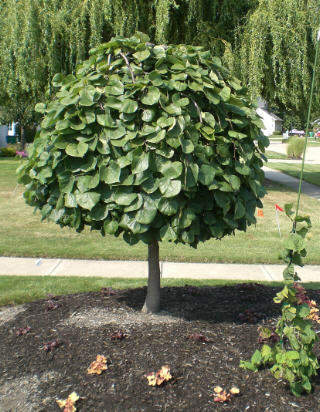 Mike, I have had a Chinese redbud for several years. It seems to be dying here in PA after some brutal winters. My one dislike was all the seed pods and resulting baby plants to weed out. Otherwise I have loved it, under-planted with white daffodils and blue grape hyacinths. I’ve heard there is now a Chinese redbud that is seedless. Wondering if the weeping one is also seedless, or would I still be pulling out baby tress every year? The weeping redbud is not seedless, but I never find any seedlings and I had hundreds of these growing the nursery and a large at home in my landscape. There is a market for those seedlings. They are Eastern Redbud seedlings. How deep does the hole need to be for the lavender twist weeper? Absolutely no deeper than the ball, actually leave about an inch and a half of the ball above grade and put some soil over the ball then mulch. Planting a tree too deep is the worst thing you can do to a tree. let me start by saying your garden is beautiful. i’ve never heard of this type of tree nor have i ever seen it. now that i have i’m on the prowl for one. all of the local nurseries around me have never heard of it either. LOL what is the difference between the lavender twisting weeping redbud and just a plain redbud? is there even a difference? Great question. The simple answer is everything! Well not really everything, they really are identical except a regular redbud grows upright, very much like a dogwood tree. The Lavender Twist is a weeping tree. It never grows taller than it is the day that you get it unless you actually stake it to grow taller. Lavender Twist is actually a very popular tree and I’m surprised that nobody in your area sells them or has even heard of them. Keep looking, you should be able to find one, there are over 1,000 licensed growers of this tree in the U.S. Not sure where you are but I still have some on hand in my nursery but most likely won’t after this year since I’m growing all small plants that I can sell for $5.97. i am in louisiana, mike. thanks for responding. i’ve done some research and i’m having to order one online. everyone around here keeps referring me to a regular redbud. i’ve called roughly 7 local nurseries and i just gave up calling due to the same conversation. 🙂 but, i’m ordering now and can’t wait to get it in! That’s great! Good luck with it. I sent one to my son in Baton Rouge and his is doing fine. At this time I do not ship plants. Possibly next spring I will ship some Lavender Twist, but we’ll have to wait and see. I like this Lavender Twist Weeping Redbud… I was wondering if it would grow in a container.. I have a large container that I want to grow a tree with a fairy garden under it.. I live in the mountains of Santa Cruz, Calif zone 9 We never get snow or bad freezes.. If this tree would not work can you suggest one that might, had been thinking of one that stayed green all year as well. An evergreen that does well in your zone would be a better option. Trees like Lavender Twist Redbud need a dormancy period. I’m in zone 6 Louisville, ky, planted a lavender twist weeping redbud in May 2015, now it is july 15 2015 and no sign of life, plant is 7 ft. tall, do you think this tree is still alive. It doesn’t sound like the tree is still alive. This is how you test to see if a plant, or a branch on a plant has died. Just scratch the bark of your plants with your finger nail. If the tissue below the bark is green and firm your plants are fine. If the tissue is brown and mushy that part of the plant is dead. I’m sure you can get one in the fall but you’ll have to look around. Check all of your local garden centers and big box stores. I have about 20 on hand right now at $49 each but once they are gone that’s it. 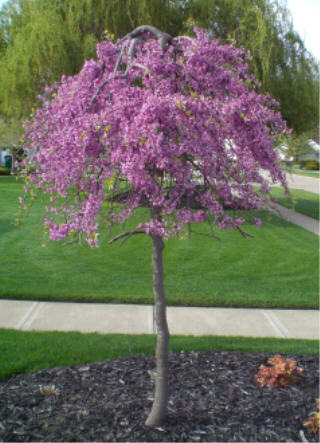 Would like to purchase a lavender twisted weeping redbud from You, but can’t find purchases on web site. I don’t ship any plants. If you’re within driving distance I still have a few Lavender Twist that I’m selling at $49 each. They’ll probably all be gone next month. Hi Mike- I love this tree and would like to add it to my garden in Queens, NY- zone 7. Can I plant it during the summer? Thanks! Absolutely! All you have to do is mulch around it, don’t plant it too deep, and water two or three times a week during the summer months. I just found your website and it is great. I was searching for information about my weeping redbud. It was planted by landscapers exactly 2 years ago. Currently it is about 3 feet tall and very full of leaves/branches. I wasn’t aware of staking it to train it to grow taller until I found your information. Is it too late to do that? Also, since it is July and I live in zone 5, should I go ahead and prune the branches so they at least aren’t touching the ground? Would it be better to wait until it’s dormant to help shape the tree? I wish I would have discovered your website earlier before my tree was so established. Thanks for your help! It’s a great little tree and I want to treat it right. Yes, you can trim the tree now, Pam just trimmed ours yesterday. If you are going to train it upright you want to do that as soon as possible because the new growth gets very rigid and brittle after a few weeks. Just grab a limber branch and tie it to a stake. I have a new Lavender twist weeping redbud planted in May. It started blooming leaves around the beginning of June. I have noticed that some of the leaves are missing none on the ground. Could this be due to deer, rabbits or some other reason. What do you recommend I do? For now I’d put a fence around the tree. Especially until it gets established. Then put it back up each fall if you have a deer problem. We planted our weeping redbud in early spring. We had tempetures that fluctuated from hot to cold through the end of May. The blossoms held up very and the leaves are fully out. We now have seedpods at the top of tree. From what I read this should happen in the fall. We are in the Poconos , zone 5. Is this normal or cause for concern? The seed pods are normal, it takes most of the summer for them to mature in the pod, while hanging on the tree. Is there anyway you can grow tiis in zone 3? Perhaps by covering soil base with straw? Last winter here in northern Ohio it was down to minus 15 then this past winter down to minus 22 and my Lavender Twist trees did fine. More than likely it will do okay in zone 3. Or at least it’s worth a try. Just about any insecticide meant for plants should be fine on your Weeping Redbud tree. I checked out your other articles on Lavendar Twist Redbud Trees but cannot seem to find the answer to my original question. I have just newly planted a Lavendar Twist in my flower bed as a center piece. (It’s about a 20 ft flower bed) Will I have to worry about a large amount of seedlings appearing due to the seed pods on my tree? Just want to know if this is a problem. (The tree is a grafted one …if that makes any difference). I don’t think so, I’ve never seen a chance seedling in my yard or my nursery. The seeds are difficult but not impossible to germinate, so it takes a lot for them to grow on their own. Does the seed pods on a lavender twist redbud produce plants …….is it invasive? Thanks…I still didn’t find the answer to my question. of invasive problem in neighboring areas around the tree? I don’t think it’s dying, but it did suffer some winter damage. Just trim as you described and it should come back strong. We wish to buy a lot of these Lavender Twist redbuds for our nursery, can you provide us with a source of small trees to pay a royalty to grow on and resell? Mike , my redbud broke in half due to the heavy snow. Will it grow back any branches? I planted it twosummers ago. It was 5 feet tall last summer. Thanks. Yes it will grow back. If you want it to grow single stem upwards from the break you’ll have to stake it and prune away competing leaders. If you don’t, it will grow multi stem from the break which is also fine. Hi Mike, I have a Lavender Twist that has some strong shoots coming out of the ground from the roots. They don’t seem to be weeping at all; is it possible that these are from the propagated root stock of a standard Redbud? After losing the top branches of the tree, causing a bad lean to one side, I thought it might be nice to twist the new growth up the trunk and have it fill out at the top to lean it all back straight, but perhaps this isn’t the best suggestion after all. Any ideas? Great video on training the rosebud tree. We bought one last year about 6′ tall and we just love it. Unfortunately last winter severe ice storm (Toronto) snapped the top…clean off but it flowered on the lower branches this year and we are ecstatic. It is now only 4′ tall, what can we do to make it grow taller? Just place a stake and train one of the branches to grow up the stake. It’s as easy as that. I live in southeast MS and have had a Lavender Twist Weeping Redbud for several years. It has never bloomed or grown much since i planted it. What do I need to do to get it to bloom? It is receiving a shady morning but gets sun in the afternoon. You and Ms Pam have an awesome yard . Really beautiful covered in snow too. We never get snow out here in riverside Ca. , heck we’d be real happy if we could get a substantial rain ! Mike, this tree is gorgeous! Do you know about how big around it will get? By the way, what in your opinion is the best way to get rid of moles? Diane, the Lavender Twist should have at least 6′ of space around it. The best way to get rid of moles in your yard is to treat for Japanese beetles. The moles are eating the beetles in the soil. If you get rid of the beetles the moles will leave. Love ya Mike ! Hope you had a wonderful birthday !! You can, but plants are always happiest in the ground. May i know how can i get ur lavender weeping willow when i am in germany ? do you think it will survive here in Germany ? anyway to buy from you from here ? that tree is amazingly beautiful.. i always want the other ornamental tree from you as well. if possible, pls reply me to my email. i am eagerly awaiting for your reply. If you are in a zone that is similar to zones 5 through 8 in the U.S. the Lavender Twist would do fine. I can’t ship to you, but you might find one on Ebay. I’ve seen small ones there for pretty reasonable prices. I have a regular red bud…any chance of trimming it to “kind of” look like a weeping one? Had a lot of seeds from it last year…what about starting one from seed and trying to train it?? It’s unlikely that you will get any standard tree to mimmick a weeping tree. No matter what you do all new growth is going to reach for the sky. A weeping variety will not, nor can it. All they know how to do is weep. But you can grow more Redbuds from the seeds that you have. Hey Mike Can I buy a twisted lavender weeping tree from you ??? Only if you come to Perry this spring. I have a few left, but not that many. Just to let you know we are in Ct and there is no one local selling these trees. We would seriously like to buy a quantity of small ones if you could put us in touch with a good source. Thanks so much, and just love your info here. I’ve always wanted a redbud tree but live in northern wis. Our winter temps are -20 to 20? Now we’ve had below 0 since nov. guess it won’t work for me, right? enlarged to the point that the garden is more then 2/3 out past the tree. Make any sense? It is getting more beautiful each yr.
done anything w/it but have learned alot from what is in it and your blogs. Redbuds are difficult to root from cuttings but can be easily grown from seed. Collect the seeds in the fall, remove the wing, soak in water for 24 hours, sow in a flat outside for the winter. When sowing cover with about 1/2″ of soil. Cover the flat with screen to keep the critters from eating the seeds. There are all kinds of options for making plant tags, but at first hand writing with a permanent marker works well enough. Mike, How tall with the Lavender twisted red bud get? Also, so you need to cut the main branch at the top to keep in in the 6 to 8-10 height? Lastly, who wide with this tree get? The lavender twist does not know how to grow tall. All it wants to do is weep over. Most are best if trained to about 7′ then allowed to weep from there. You have to trim them to maintain shape. Wide? Give enough room so it can get 6′ wide. I now live in Northern Europe and although my garden and lawns look good winters here can kill all plants in winters hard. Down to 34Cel below. If snowing great but if not the earth freezes down to 2 meters over night. Summers reach 96 cel high regularly and summer lasts that way half the year.I am building a sort of Japanese garden and desire a nice weeping tree for about six feet back from the pond water bank. It need be no more than twelve feet high but only five across. The gum tree range looked good until I researched. Now Lavender twist and your article on this tree interests me but you have not said if it is hardy down to zone 7.. We have an old willow tree that is over sixty feet high at the end of a field near by. How about Lavender twist and if so where do we buy one? I’ve been growing Lavender Twist here in zone 5 Ohio for many years now. The past two winters we’ve been well below zero F. for days at a time. -21 F. this winter, -15 last winter. My trees have done remarkably well in these cold temps. Clematis roots appreciate a shade spot but the vine itself needs lots of sun to bloom. Can this tree be started by cuttings. And at what age would the tree be when it would look good to sell. Lavender Twist is a patented plant, therefore it is illegal to propagate it with a license and a license it probably a thousand dollars. But it cannot be grown from cuttings and even grafting it is a bit tricky. Best to do what I do and buy small plants from a licensed grower, grow them on and resell them. I have a beautiful pink redbud covey. It came from a nursery with just a small two inch curve at top. Is this the start to the weeping. You sAid to trim lower branches. How much. Many thanks. P.s. do these only grow from seed? D. All of the new growth that comes out will weep down. You can allow the tree to weep all the way to the ground or trim it up. They do not grow from seed, have to be grafted. How about zone 10???? We are right on the split between zones 9 and 10! I have to agree, Mike, that IS a gorgeous tree and the snow-covered pic is beautiful! We don’t see snow like that where I am in North Carolina (usually), not that I’m not gratefuI! I’m partial to weeping trees myself. Love hearing from you! Thanks, Mike. I have a redbud in my yard, but the blooms are short and not full at all. I thought it was due to “aging in”, but its been over 5 years now! Any special soil treatment? Where mine is its a bit sandy, also on a hill. I trimmed it last fall, to help force more blooms. I know they grow in my zone (Providence, RI), since my neighbor up the street has one. Go out there right now and do some root pruning. Take a spade and stick it in the ground as deep as possible all around the tree. You have to do this now during the winter when the tree is dormant, not during the growing season. Root pruning really does a lot to stimulate an establish plant that has come to a stand still. Root pruning stimulates new, fibrous root growth which allows the tree to pick up more nutrients. I got a small weeping redbud from craigs list/ the landlord was gonna pitch it/the tenant put it on craigs list. I got it right after I had to cut down a mulbery tree that was coming down slowly in pieces. Where I planted the redbud had roots and brick down in the dirt so not very deep and also the site of a previous maple. I wonder if the roots will spread out sideways if they can’t get below or should I transplant in the spring? I read that they don’t like to be transplanted. I really love this little tree. I do have it staked. This is a beautiful tree. I’d move it to a place where it has every chance of thriving. They do not mind being moved, but you have to do it while the plant is dormant, not during the growing season. Thank You very much, I enjoy reading your information and appreciate it very much. I would like to order some of those air layering devices that you demonstrated when they become available if you would be so kind to let me know. Thanks again and keep growing. Les, I think what you are looking for is http://airpropagator.com. Hi! I live in Houston, Tx. Your pictures are awesome! I was wondering if the lavender twist weeping red bud tree would survive here? It’s just gorgeous! It really depends on your zone. This is a tree that really needs a dormancy period so it can rest, I’m not sure if you have enough cold weather for the Lavender Twist in Texas. I have found that pruning weeping trees annually ( cutting back to 2 buds on this years growth – using 45 degree cut – after first frost removing any dead wood) thickens up the tree next year and stops it growing too large and out of shape. Not tried these but will do so later this year. I was reviewing video on air rooting of plants – where can I get the black plastic(?) pods with the rooting medium ( the ones you use electrical ties to hold in place), Please ? When do you cut and shape this type of tree? Would a late in the year trimming affect the spring blooms? I also wonder the same thing about my weeping cherry trees and crab apple trees. We live I Ohio and would a winter like the one we have this year be too much? Thanks and we appreciate the gardening tips. J. Lavender Twist is a vigorous grower and really should be pruned at least twice during the growing season. This is a tough plant that can handle cold weather, even a winter like this one. Same with weeping cherries, prune, prune, prune. I almost forgot to ask. What kind of tree is the largest one in your snow photo? Is it also a weeping variety? Thanks again! Hey Mike thanks for reminding us about the beauty of the LTWR tree. I will be getting one for my place for sure! And I’m lucky, my local nursery had some last summer, so I’m sure he will have more this summer. Also, I wanted to thank you and Dustin for putting out the new info./course on internet marketing. Can you tell me, will you be going over more info. in this course than you did in your previous course on internet marketing? I assumed probably so since this is more interactive. Thanks again Mike! Mike, I love your posts and appreciate the knowledge you impart on all of us. I found this to be an interesting page about the origins of the Lavender Twist Redbud. The article mentions grafting but I was going to ask about propagating this tree from cuttings? Are most redbud varieties grafted? The Lavender Twist redbud was discovered and developed by a friend of mine, Tim Brotzman from right here in Madison, Ohio. This is a patented plant so it’s against the law to propagate it without a license. But that’s not a bad thing, it’s really tricky to propagate and does have to be grafted or budded. I just buy small trees from a wholesale grower, pay the royalty at that time, then I’m free to grow them on and resell them. Eastern Redbuds are actually fairly easy to grow from seed. I brought the tree home planted it in a choice, good ground location. Guess what ?? It lived I have cut it back some to rid the damage. but, one side is pure white. The other side is a rosy purple. Starts out hot pink turns purple and then after about a week it sheds. Beautiful specimen. freebie worth a fortune ! I would like to buy your book, but want a hard cover not an ebook. How do I go about doing that.. Very pretty tree! And a lovely form for all seasons. How old is the Redbud pictured? Wonder if anyone has found it in the Seattle-Everett area. Been enjoying all your emails and info. Helen, I’ve had that tree in my front yard for about 8 years and it was probably 5 years old when I got it. Hey Mike…even thename of this tree sounds delicious. I’m over on the north side of Lake Erie sort of…just nort of Toronto. Would one of thse survive up here? Give your donkeys a hug for me. I searched for and found this tree after the first time you pictured it. I love it, thanks Mike. When you trim off the lower branches, I am assuming that you can start them again and gain several trees more from them. True or False. That’s really false. For one the tree is patented and secondly it will not propagate from cuttings. It has to be grafted or budded. This Weeping Red Bud is absolutely gorgeous, how would they work in the S.E, I do have Red Buds that are doing quiet well here, transplanted from the Piedmont area, but not sure if it could take the heat here. Thanks for all the info, you are great!! They do fine all the way into zone 8 for sure. If you have regular redbud there now, the Lavender Twist should be fine. That would be my guess. I live in Vermont which has recently been changed from a zone 4 to a zone 5. The weather hasn’t changed, and we often get temperatures of -20 or lower in the winter, but the “Experts” tell us that it is not a zone 5. The plants don’t believe it. I have friends that tried a Rosebud tree. It only blossomed once before being killed by the winter. I doubt if it is worth the money to push mother nature with this. Mike all my plants were doing good, I had forsythias, azalias and other ones until 2 weeks ago. which I planted last fall. Pretty one evening as I checked them two days later they were dead all the way to the roots . what happened. please. I live in northeast Georgia. First of all, you have to be sure that they are all dead. Right now just about every plant we have looks dead, but it’s not. They’ll be fine. You really can’t declare most plants dead during the winter. You have to wait until warm weather to see how they respond to that. Plus, you just had some pretty severe weather for your area, with more coming now. Don’t throw the baby out with the bath water! Wait till all chance of frost is gone, then check to see if it is greening at all; then wait a couple more weeks before deciding it is dead! Mike, Do you know if the Lavender Twist redbud could be grafted to a eastern redbud? Another Great One of your numerous collection Mike ! A Zone 4 grower may have luck if they used some protection I imagine.. I live in Zone 3b..very close to Zone 4 line..but with our sometimes ‘very cold temps’..then are ever occuring ‘Chinooks’ we see..a very difficult area to try and ‘push it’ so to speak with many varieties ! We can be -20 and within 12 hours..be +10..with 50 – 80MPH SW Winds along with those extremes ! I have many shrubs that have winter die back every year..Hydrangea ‘Annabelle’ does very well..so does any thing that has to be ‘cut back to ground level’ ! Only thing close to your ‘Lavender Twist’ in this area I have seen, is a ‘Weeping Siberian Pea Shrub’.. (yeck !) Never did like them ! Keep the ‘Great Info and Pics’ coming, Mike ! Its ‘almost Spring’ ! Here is an example of the next few days here in 3b..these temps are in Celcius..
Tonight, 30 percent chance of flurries before morning. Wind west 50 km/h gusting to 70. Temperature rising to plus 1(33F) by morning. Tuesday, Cloudy with 30 percent chance of flurries in the morning then a mix of sun and cloud. Wind west 50 km/h gusting to 70 diminishing to 30 in the morning then becoming light in the evening. Temperature falling to minus 13 in the morning then rising. Wednesday, Cloudy. Low minus 12. High +9. Thursday, A mix of sun and cloud. Low minus 3. High plus 4. ! Very tough on any Trees, Shrubs ! We can have a week of very nice temps, and a lot come out of dormancy..only to drop back to 40 below the next week ! I love Redbuds, especially since they are the tree to remember the bombing in OK City. We lived in OK at the time and the building held all my information from immigrating to the US. It hit very close to home. I try to plant a redbud wherever we live. Thanks for all the information. We will be moving to Iowa this year and I’ll have to rethink my gardening again. But it will be fun. After we get settled I am planning to buying your plan and subsidizing our income with something I love to do. The Lavender Twist does not know how to grow tall. Left untrained they’re pretty much just grow into a low mound. So in the nurseries they are trained to a height of 6′ or so, then from there they just grow wider and weep more. Shade? Some shade, but they really need some sun. I’ve been wanting to get one of these for a long time now, but the price has detered me. Mike, is this something we can add to our backyard nursery? Is it a grafted tree, and if so, is it grafted to Eastern Redbud stock? I would really like to be able to sell some of these. I brought a 6 gallon lavender twist weeping redbud tree at Los Angeles, California. Half of the tree have buds and then they died and not single leave ever appear. Do they grow well at Los Angeles, in Southern California. I seldom see people have these kind of trees in their garden. I am thinking of potting this dying one and then buy another one. I scratched the branches, the lower branches still have ” green part” inside, but the top smaller branches have brown inside pulp. Where is your lavender twist garden? What part of Texas. As long as you still have green tissue below the bark there is hope for the tree. Lavender Twist like all deciduous shrubs needs a dormancy period and needs to rest over the winter, so they may not do well in your zone. I don’t honestly know, but give it a chance. Thanks, I was hoping to have another one to put in my yard.but thank you for your help! I have a weeping red bud and there are little ones coming up around it , will they be weeping too? Your little seedlings are almost guaranteed to not be of he weeping variety. But you never know for sure. You’ll know, if they are weeping they’ll just lay on the ground and not grow upright at all. Thanks Mike – the pitfalls of living in the city. Can this be grown in a large pot? It could be, but plants really are the happiest in the ground. A potted plant needs winter protect and you have to keep them fed. Just planted a bareroot Lavender Twist about 5 weeks ago. a couple times a week. Any way to jumpstart this guy? Not really much you can do but wait. Your tree was bare root. I suspect the plant dried out a little while be stored as a bare root tree and the buds were damaged. The tree needs time to figure out what happened, then make new buds. It’s frustrating, but there’s really nothing you can do. Right now fertilizer would surely kill your tree. Good news is you only one tree. I have 250 in exactly the same state right now. Yeah, it’s frustrating. can this tree be planted in zone 6? Redbud ain’t gonna make it in Lake Wobegon. A long time ago I had a Variegated dogwood tree when I lived in Pennsylvania I received from a local nursery. I really loved this tree. I move to Delaware & can not find anywhere. The leaves were green with white edges & the flowers were white with pink edges… oh how do I get rid of cable grass. This grass takes over everything, grows even on my driveway. Thank you. Eric, the dogwood you describe is probably Welchi, another is Rainbow Dogwood. Use a non selective herbicide on the grass, but don’t get it on any other plants. Mike where is your nursey? Louise, my nursery is in Perry, Ohio but at the moment I’m really not selling any plants. Maybe next year. Still trying to put the nursery together. I just pinned this from here. What a pretty tree! About how tall at maturity? Susan, because Lavender Twist Weeping Redbud is a weeping tree, it will only grow as tall as it has been trained to grow. So pretty much what ever height yours is when you buy it, that’s as tall as it will be. It still should be pruned for shape, if not it will just grow in all different directions, but not in an upward fashion. Many of these come out of Texas, I have seen Yellow, White and Orange flowering “Redbud” an they are very expensive. Most are standard “Redbud) type. Mike, I’ve been researching a specimen tree for a smaller bed in between the house and driveway and I keep coming back to this Lavender Twist Weeping Redbud tree. I was happy to find your video on how to train it to grow upright. I found a local, well respected nursery selling 3 year old trees that are about 6′ tall. ($80) I was hoping to have it grow up to 8′-10′ tall. Is it possible to train this tree to grow taller at this point? Or do you have any recommended sources to buy it younger where I can get train the tree myself, so I can get more twists and turns in the trunk area and stake it to grow taller? Thank you. You can train it to grow higher it just depends on how full the head is now. If the tree has a nice full head, it’s going to look funny if you try and make it taller. You’d be better off with a smaller one that can still be trained if your need that kind of height. Mike, it this Lavender Twist hardy in places like centeral MN? I have a spot that is protected and gets sun about 8 hours a day. I have been trying to find something colorful and this tree fills that requirement and looks good when not in bloom. Peg, if you can find one in your area I’d give it a try. Does really well in zone 5, could probably tolerate zone 4 well enough. This is beautiful! I want one!! Very pretty! You will have to find a pic online to pin to Pinterest…can’t pin from your pics, or from facebook. glad to see you also on pinetrest. !! I love your posts ! Gorgeous. Where can I get one? Or two, or three . . . .